When you arrive at 40 Doric Way all you’ll see is scaffolding and ‘Euston Chinese’. But don’t start thinking Time Out’s failed you. You might think you’re lost, but the dark, dingy basement restaurant below the neon ‘open’ sign is the right place. The king you seek is inside, and like Elvis he steals the show with his fresh roti canai. I have been working in the area for a few months now and trying to find a tastie lunch option that wont break the budget. I can VERY happily report I HAVE FOUND IT!!!! I went for take away lunch and got noodles and a dahl with paratha - I can safely say both were delicious. I cannot wait to go back and have dinner there. We came here for afternoon snack/early dinner, which turned out to be a pretty good strategy as during meal times the line goes really far down. It was a carb-overloading meal but everything was delicious. Flat noodles for some reason can be hard to find in asian restaurants in London, so we were happy to see if here. The roti canai and dessert rotis were superb, we were expecting more of a curry for the roti canai but it was more of a daal that's served here. Definitely a hole in the wall sort of gem! 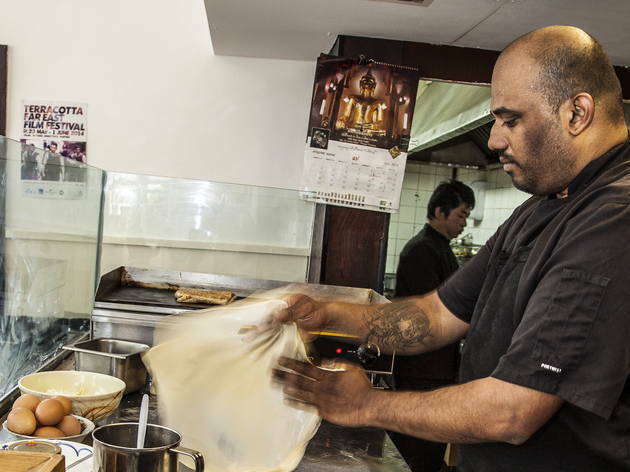 Be prepared to wait a little when visiting Roti King. Around the corner from Euston station, it is in a basement level with really limited seating. But once the wait is over you will be glad you made the effort. 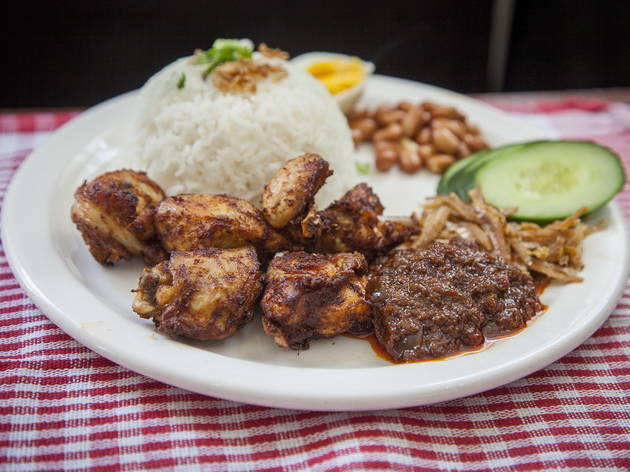 Roti King is inspired by Malaysian/ Indonesian flavors and is presented in its original street food style. We got the Roti Canai and the Beef Rendang, although the rice was a little dry with the Beef Rendang, the Roti in this place is amazing. Stick to what they’re known for and you will not be disappointed. Don't be put off by the long queue at this place. 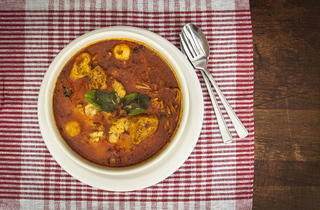 You will be rewarded with authentic, comforting and yummy Roti Canai and curry. The spice use is generous here. Beside Roti Canai, I love the lamb murtabak and the generously portioned Kangkung Belacan (morning glory in shrimp paste sauce) - it is easily one of the best in London. Prices are low, hence expect no frills decor and service. I will most definitey return. 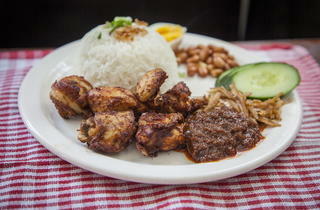 This place is often touted as the best place to get authentic Malaysian food and that would be an accurate description. The food is yummy and such good value for money. Unfortunately, it's not possible to book and the queues can sometimes be long. However, the food is well worth the wait. With its grotty surroundings, proximity to Secrets and very undistinguished front, this institution is very easy to miss. I only recognised it because of the queue of 20 or so people assembled on the pavement at quarter to six on a Monday evening. We waited patiently for around thirty five minutes before we were finally lead to our table in this basement restaurant. There were only a handful of tables and calling it cosy would have been an understatement. After such a wait expectations were high. I ordered the murtabak, (roti stuffed with chicken curry) with lentils as an accompaniment. The pieces of roti or Malaysian flatbread was buttery and doughy. This was delicious. The colourful seasonal vegetable stir fry that was laced with ginger, that we ordered for the table to share, was demolished. Roti Kind has never been praised for its service. We had to help ourself to tap water. However, it was prompt and we discovered that our own friendly waitress used to dine there before joining the staff. Talk about being a fan girl! Please note it's cash only and there's a £10 charge if you bring your own alcohol. We consumed 6 dishes between the 4 of us and the bill came to under £44. Great value for such tasty and well portioned food. As we left we were treated to the spectacle of one of the chefs adroitly spinning the dough. Along with the top drawer food that was another abiding memory. Hidden away in a side street, down grubby stairs, in a soulless room with a few canteen-like tables, Roti King doesn’t look inviting but is definitely worth a visit. Definitely. The fresh roti are out of this world – so much so that they taste as yummy as the ones I get when travelling back to Sri Lanka. And they’re so cheap. What a treat! The ambiance and basic décor lacks in style and personality and the rest of the dishes on the menu don’t live up to expectation, so I wouldn’t recommend trekking all the way for a meal. 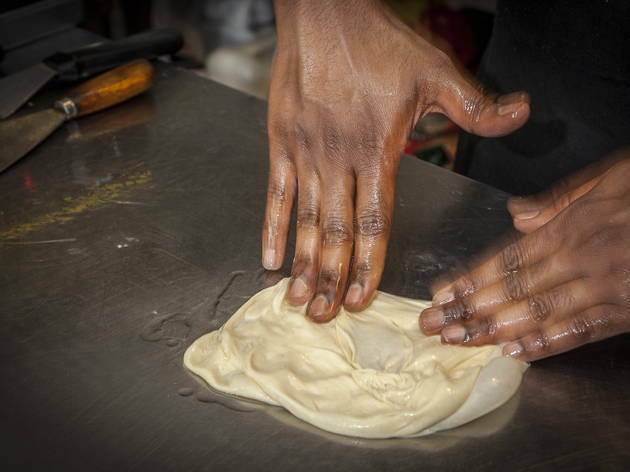 Instead grab a roti on your way to the station for a succulent treat. The queue out the front already gives you the expectation that this place will be good. This little hole in the wall place gets very busy, so make sure you get there early! Tip: get there early so you get a table in, the tables are small so I would recommend smaller groups. Good For: cheap and cheerful, small groups, quick dinner/ lunch. 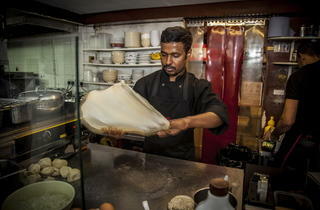 Roti King is a tiny little cafe/restaurant hidden down a back street near Euston station. It gets really busy so I would recommend getting there as close as possible to 5pm (when it reopens after lunch). My favourite part of the meal was the Roti Canai. The Roti was so fluffy and crispy at the same time and not greasy at all - which was a good surprise after I'd watch the chef making the roti on the stove near our table. My friend had the beef rendang which she said was dry and I had the Nasi Lemak which was flavoursome however the fried chicken was also dry. 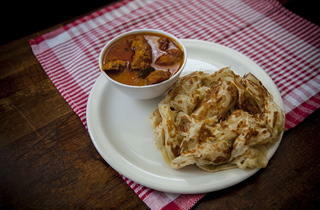 It definitely is the Roti king, with the roti being the best dish on the menu! Roti King is a little gem you will keep going back to time and again. This is just around the corner from my office in Euston and I whenever I go (around 1) it's often quite busy but doesn't take too long to get a table if there is just one or two of you. The roti here are so amazing and you can see them being made by the chef in the open kitchen - he is like a roti making machine! 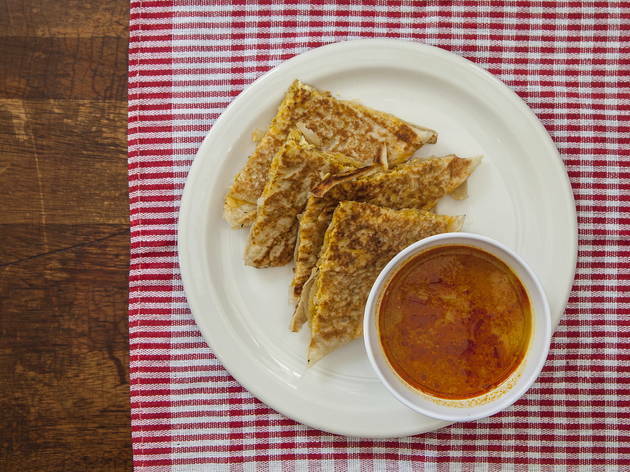 The roti canai special, which is 2 roti and a bowl of curry, is a bargain at £5.50 and is one of the best lunches out there! I also have had the nasi goreng before but for £6.50 I think it is quite expensive for what you get - although it is really delicious . The food is sometimes not that fast and comes out when it's ready which can leave you eating on your own as you don't have a lot of time to spare on your lunch. The do takeaway too I think, although I've never tried this. 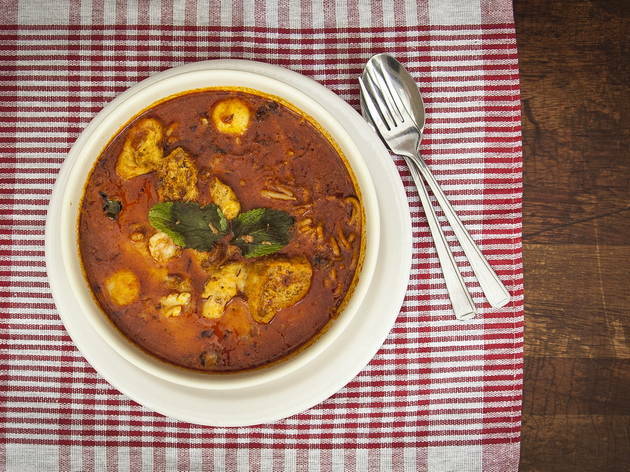 Why not forgo your usual pret sandwich for something a little different - you won't regret it. I've been meaning to go to Roti King for a long time. Finally made the visit. We turned up at 4 only to find out they close between 3-5pm. We decided to wait around in the area and got back just after 5 - that hour wait was worth every min! - It's a small cosy restaurant so shouldn't really bring more than 2-3 friends. After hearing so much about Roti King from local friends, my friend and I decided to check it out to see how authentic they really were. We had been planning this meet-up since half term but only just got around to it because of how hectic we’ve both been with our weekly workloads and assignments. As it was a Friday afternoon, I understood why there was a queue outside the restaurant. However, upon entering the place, I realised it was also because there is not much seating and that they only seat you once your entire party has arrived. I got there before my friend and stood in line for a spot for two but because there were couples and groups with all their friends present, they were allowed to go ahead of me, which is fair enough. We decided to share so we could try two different types of roti. 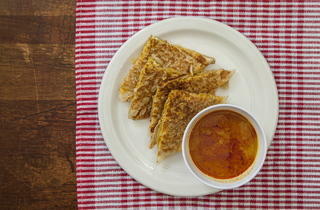 The first was the standard Roti Canai with dhaal. This was actually done pretty well! I liked that the roti was obviously made-to-order so it came out looking and smelling fresh and warm. 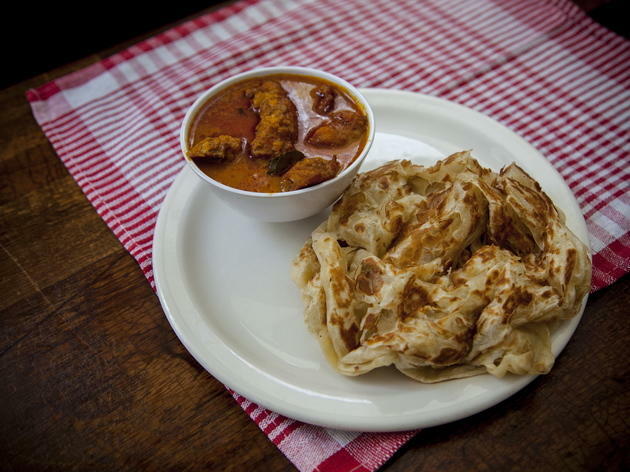 One order comes with two pieces of the roti canai and a small bowl of the dhaal on the side. So we each had one pieces and to be honest, that was already pretty filling. The roti was crisp on the outside and remained fluffy and soft on the inside, which I liked. The dhaal was pretty average tasting but went well with the plain roti. Our second order was a plate of Cheese Roti because we saw the group of four next to us having it and it looked really enticing. We were not disappointed, the cheese was perfectly melted in between the crispy roti and was served to us still warm and gooey. This roti was a lot more greasy looking than the roti canai though, probably because of the cheese content. It was also a lot more crispy and pressed flat rather than fluffy like the roti canai we ordered. But overall it was still pretty darn good! So the hype is definitely real and the roti lives up its reputation. It’s authentic in taste and appearance! I saw quite a few other tables ordering the other traditional hot dishes such as Char Kway Teow and Laksa, which also looked really good, especially the former. When I next come, I will definitely be trying it. This could well be the first Malaysian & Singaporean restaurant in London that I’m impressed with! This place looks nothing from the outside in a backstreet of Euston. But the food was amazing - I have visit Malaysia and can honestly say this was perfect food really reasonably priced. The inside is very small and you sit on shared tables but that's OK when the food is soooo good and delicious. 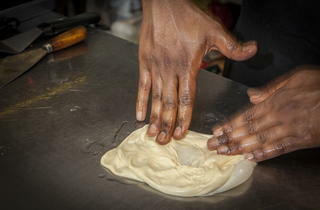 Try the Roti's and a selection of stir fry dishes. The only big issue was the crazy queue on the outside on a Saturday afternoon - but it was worth the wait! Fantastic, tasty, cheap, like being back in Malaysia. The queue's worth it! I'd heard this place was AMAZING. That meant I went with high expectations. I hadn't taken in how cheap & cheerful/rough & ready it would be. We were there early & got seated after not very much queuing. As we left the queue was huge! The seating is really tight & crowded. I knew I wanted the roti canal so didn't really examine the menu. I had chicken curry - it and the roti were delicious. A quite small bowl - again quite rough - quite a few bones but totally delicious. My friend had lamb - that was also gorgeous. Looking at some if the other dishes they all looked great. Though not much in the way of fresh veg. For a place that thrives on quick turnover our food took quite a long time to come. Overall I'm glad I went but it wasn't the ideal venue for the sort of relaxed, chatty evening catching up with a friend I don't see that often, that I wanted. If I lived or worked close enough it would be great for a carry out & it is REALLY CHEAP, £7.50 a head! Lesson of this is to manage my own expectations, as I was mildly disappointed but that was all my own doing! We arrived to this small authentic Malaysian restaurant with my mum and auntie (Malaysian) & we were highly impressed with this tastie dish, Cantonese Ho fan. We also had the laksa and the roti with chicken curry, all not good for the waist line so not a regular in our diets. 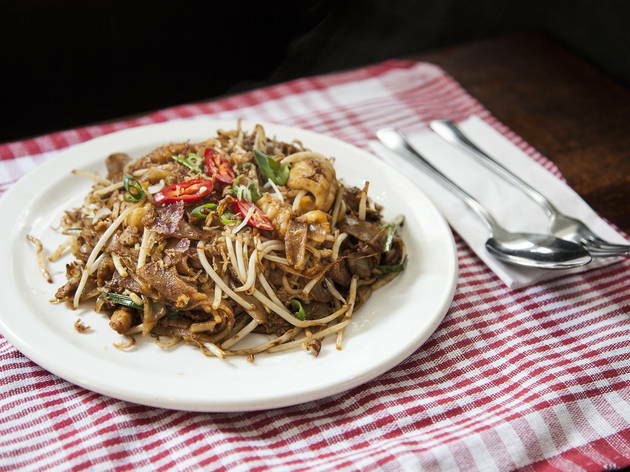 They we're all authentic, exceptionally well priced with large portions -so a definite must in London if you're into Malaysian food or just want to try something new. I don't like to tell a lot of people about this place, but this truly is London's best kept secret. 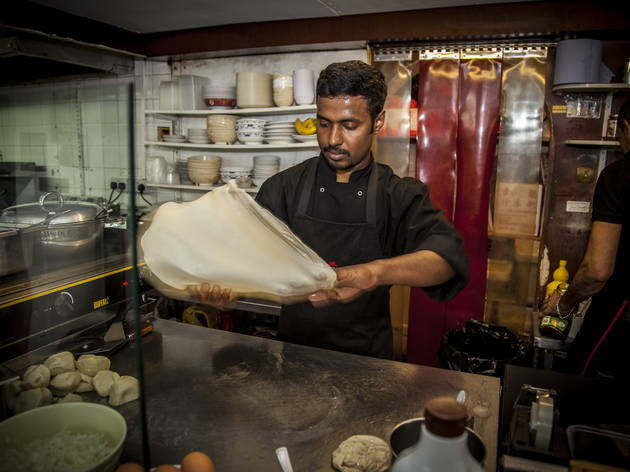 Once a dark and dingy hole in the basement, it has now transformed into a trendy cafe, with industrial light-fittings, still serving the best roti canai in London! As soon as you walk in, the smell of authentic Malaysian curry mixed with the buttery flaky goodness of roti hits you at the door. It still is a no frills no fuss Asian restaurant where service is minimal, but the food outshines the lack of friendliness, which I prefer. If you don't know what the roti is, drool over the pictures attached and get one in you ASAP. If visiting the kingdom for dinner, make sure you arrive before 6pm or be prepared to queue. It is also one of the few places in London where you can bring your own beer or wine for a small corkage so it's a great spot for not-so-sensible mid-week catch-up with mates. 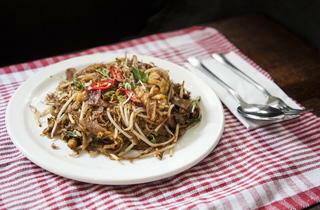 Very authentic Malaysian food made freshly and at a great price right in the center of London... Feels just like home.